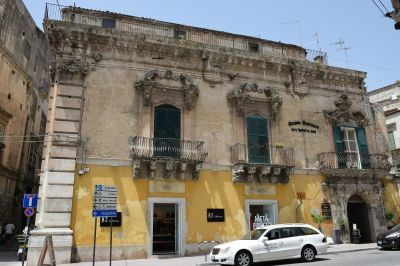 W-02D1JX - Top floor of a historic building in the heart of Modica, on Corso Umberto. This is the historic "quartino" used, at the time, by the servants of the family, who owned the building. It is totally autonomous and has an independent entrance from a side street, accessible from the cars. The property consists of a half-space half-scale and eight rooms plus accessories on the upper floor, for a total of about 230 square meters. A long balcony defines the perimeter of the apartment and overlooks the main street, while the terrace is located in the most internal and reserved part. Still present a good part of the original floors. To be restructured. It is a truly unique property both for its location, overlooking the main street of the Baroque city, with a view of the main monuments, and for the terrace, not easy to find in the center, and for the size of the apartment that allows to reuse it also as a hotel as well as a splendid residence.